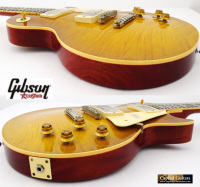 ​​Specifications for this incredible guitar include a non-weight relieved mahogany body with spectacular flame Maple top with a Vintage Lemon finish, VOS light aging and a super light total weight of just 8 pounds, 2.5 ounces ( 8.156 pounds)! 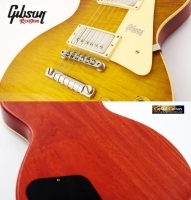 It has a '59 C-shaped neck with moderate shoulders and depth measurements of .880" at the first fret tapering up to .980" at the twelfth. 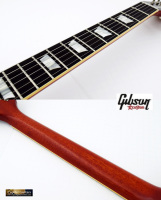 The fretboard is a fabulous slab of almost black Brazilian Rosewood. 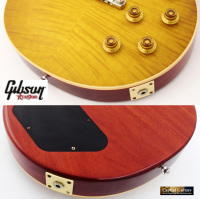 It has Gibson's Custombucker pickups. 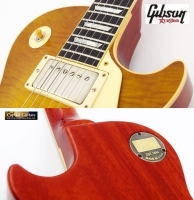 Other details include hide glue construction, long neck tenon, 12" fretboard radius, 1-11/16" nut width, 24.75" string scale and an ABR-1 bridge and tailpiece.